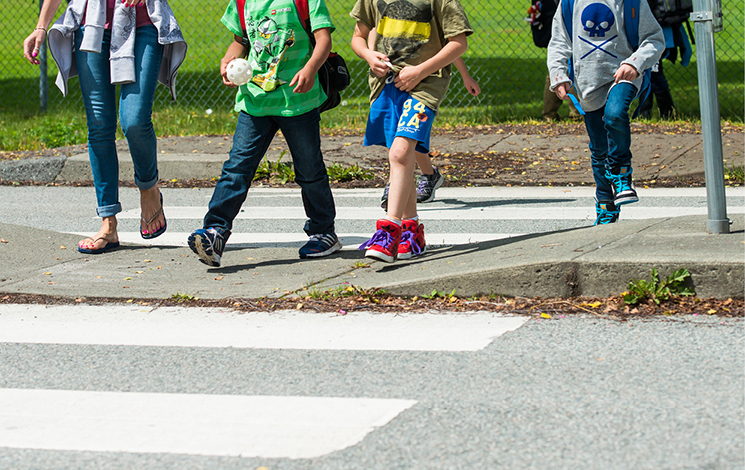 We work closely with the West Vancouver School District to improve safety near schools. Traffic calming like traffic circles, speed bumps, signage, and one-way drop-off/pick-up zones help to organize traffic and slow cars down. Sidewalks and crosswalks near schools create safer spaces for pedestrians to walk. While infrastructure improvements are important, we also need participation from parents and the school community to help make improvements as effective as possible. Plan ahead. Give yourself more time to travel than you have over the summer. Slow down. Obey 30 km/hr speed limits in school and playground zones. Pay attention. Set aside distractions and respect and follow directions of any flag persons on your route. They direct traffic to keep everyone safe. Walk, ride or roll. Fewer cars in the school area reduce traffic, so avoid driving if you can walk instead. Students who choose active transportation are more likely to meet their daily requirements for physical activity. Drive 2 Five. If you can't walk or roll all the way to school, try parking 5 minutes away and walk with your child. After school, meet them at school and walk back to the car together. A walk is a great time to connect with your child and can lead to better concentration in class. "Pick-up and drop-off only" means NO PARKING. These spots are intended for your child to quickly and safely exit or enter your car. Please park somewhere else if you plan to linger. Do your homework. Consider a practice trip to school before your first day. Fewer cars in the school area reduce conflict, so avoid driving into a congested school area if you can walk instead. Obey posted "No Stopping" and "No Parking" signs. Pick-up and drop-off only means no parking. Please park somewhere else if you plan to linger. Walking and cycling to school helps reduce traffic congestion near schools and improves safety. The more people walk, the safer the school area is for walking. Beginning and ending the school day with active transportation is good for your body and your brain, plus it’s a fun way to cut down on greenhouse gas emissions for a cleaner environment. Dress to be seen. Wear bright clothing or backpacks. Be safe, but enjoy yourself! Don’t assume a driver sees you. Make eye contact with drivers before crossing. Don’t enter the road unexpectedly. Choose to carpool, bus or use active transportation options (such as walking), which helps reduce congestion and increase safety in our school zones during busy pick-up and drop-off times. For more information, please contact Roads and Transportation. We invited West Vancouver students to submit short videos of their own creation for the student video contest on safe and active transportation.